This project involved creation of a regional transportation hub accommodating local and interstate bus services, taxis, and daily commuter traffic. A covered platform with twelve bus spaces, a 3500 square foot terminal with a waiting room and offices, four parking decks above the transit facility accommodating 600 cars, and pedestrian connections to Rutland’s downtown shopping streets were all part of this project's program. This building was completed in the spring of 1999. One of the main concerns voiced during the planning stages of the project was that patrons of the facility needed to feel a sense of security. This was achieved through the use of daylighting at the central core and extensive use of glass in the stair towers. This bright, visible environment allows pedestrians to see potential danger before they walk into it, critical in providing the desired level of comfort. Connections to the facility's stair towers provide access to the upper levels of surrounding buildings. 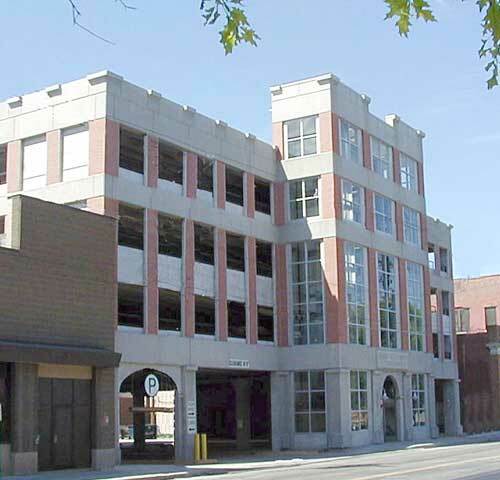 Service entrances for existing buildings were maintained to allow deliveries to take place without blocking traffic on neighboring Center Street and Merchant's Row.